Developing countries are driving some of the growth. "Even with the economic downturn, overall quality of life is improving globally," says Curtis Foltz, executive director of the Georgia Ports Authority. "People with more economic means are more likely to consume vegetables, fruits, and protein-based products, creating higher demand for these products worldwide." And along with the increased interest in better living, the popularity of the home amateur cook and cooking programmes in general giving new life to regular ingredients, more than ever, we are more aware of what is available to us. While the U.S. focus on cold chain safety is continuously evolving, some developing countries are not yet keeping pace. The United States imports about 30 percent of its fruits and vegetables, and foods imported from less mature markets—where access to refrigerated trucks may be limited, for instance—can present a challenge. For this reason, a holistic view of the cold chain is vital. "Complete visibility and traceability is incredibly important in case of recalls," says Don Schoenl, president and chief executive officer of Nordic Cold Storage, an Atlanta-based warehouse operator specializing in cold storage and distribution services to food producers, distributors, and retailers. "Our ability to track a product from production or harvest all the way to consumption is critical for ensuring quality." Technology plays a significant role in enabling cold chain traceability and data exchange. Since cold chain logistics requires maintaining temperature integrity, controlling all the processes involved means high levels of integration and coordination. Each supply chain step and partner—from farmer/harvester or producer to the ultimate seller—shares responsibility and there are multiple phases and facilities along the way which contribute to keeping products fresh. For example, cold chain transportation units are commonly designed to keep ambient temperature constant, not to bring a shipment to the optimal temperature. 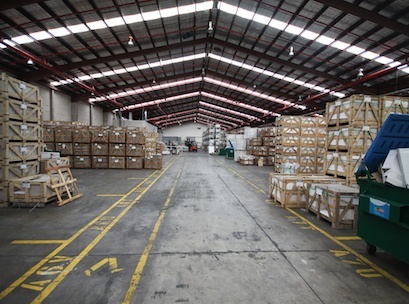 But if a shipment is not adequately prepared and conditioned, its quality may be compromised. Further, if a shipment will be exposed to extreme cold or heat along the transport route, considerations should be made to protect the products in transit. Transportation that extends over multiple days provides a host of opportunities for breaking the cold chain. "Route selection is important in order to maximize cold chain performance, especially in winter and summer," says Hernandez. "In extreme temperatures, companies should select routes that minimize the number of times doors must be opened". There are also a number of speciality doors available for both on-site facilities and transport vehicles which help to maintain temperatures. 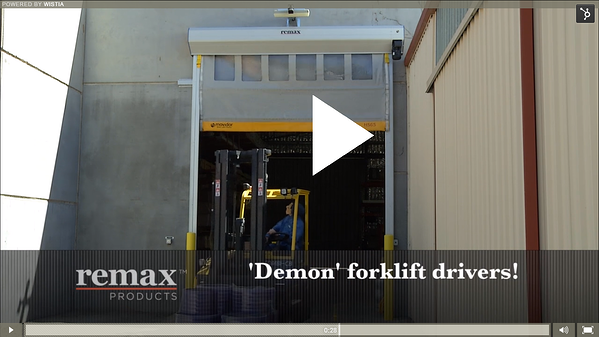 Such as the automated High Speed Rapid Door which only opens when requires and automatically closes once the person/forklift/vehicle has passed through. It is not only the automation which creates a more efficient doorway but think about how many times during the day that a forklift/vehicle operator may be required to exit their vehicle to open a regular manual facility door, and then get back, drive through the opening and exit the vehicle once again to close the door behind them (and if they do indeed close it behind them each time). Every second that the door remains open longer than it needs to - you are losing valuable temperature conditioned air. Hernandez continues to say that "a lot of monitoring and management goes into handling cold chain shipments. Knowing about extreme weather conditions in advance helps optimize equipment use and better protect products." Contingency planning is also important. If a truck breaks down, or a refrigeration unit stops working, the carrier or 3PL must be ready to respond. Even with the best systems and monitoring technology, an unplanned delay or rerouting could potentially jeopardize shipment stability. Shippers should work with their transportation partners to develop contingency plans that clearly map out a strategy in the event of a delay. The entire cold chain process should be about minimizing the time it takes to move a product through the system. Efficiency is key and vulnerabilities occur if there are delays in handing product off from one facility or stage to another. To manage cold chain shipments well, all parties must foster a strong partnership. Everyone needs a good working knowledge of best practices for cold chain handling and transportation. Food products have to move as fast as possible to give consumers the most valuable, nutritious, wholesome product, with as much shelf life as possible. Energy savings is a recurring theme in cold storage because it’s more expensive to cool air than to heat it. At the same time, different products require different temperatures. For example, vegetables can be stored at 55°F, dairy products are stored just above freezing at 34°F, meat is stored just below freezing at 28°F and ice cream is stored at –10°F. That can create challenges for third-party logistics (3PL) providers who may on-board or off-board clients throughout the course of the year with different storage requirements. “In the cold storage environment, reconfiguring space isn’t as simple as it is in a conventional warehouse because you have to take temperature into account,” explains Ray Stahnke, account manager at Randall Manufacturing. 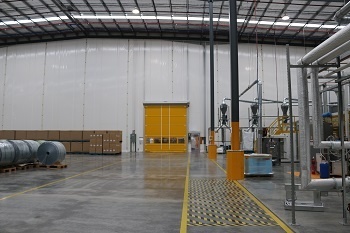 For warehouses that require multiple temperature zones or where the mix of products being stored changes with the season, a Temporary Flexwall Dividing wall system is a flexible, low-risk option that can go up, come down and be moved from building to building as business needs change. 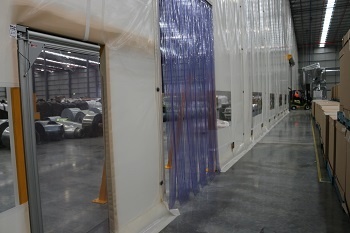 A huge advantage of the Flexwall system is that Rapid Doors can be installed within them as they have a bespoke supportive frame, so larger vehicles still have access to all areas of the site. Read about a recent project at Linpac where Flexwall was installed at a rented warehouse site in Victoria. Stripdoors can also be installed in doorways to contain the refrigerated air and can be made to many sizes. 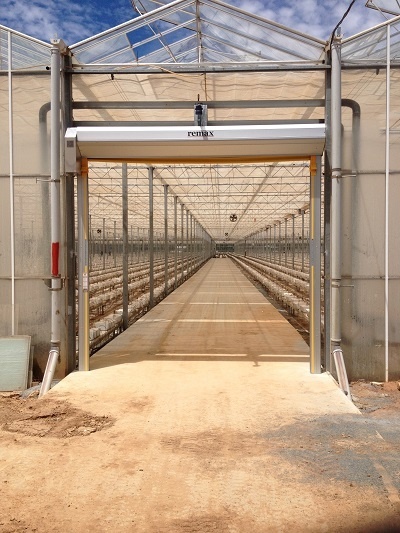 Refrigerated air is expensive, so once you make one change to the room or a wall, cost savings is realized,” Stahnke adds. Read more about these three methods, click here.